Communes, wards, and towns in Viet Tri city and surrounding districts in the northern midland province of Phu Tho held a kieu (palanquin) procession on April 12 as part of the Hung Kings Temple Festival. The kieu (palanquin) procession at the Hung King Temple. Various cultural activities will be held worldwide to celebrate the Hung Kings Memorial Day which falls on April 25 this year. The annual Hung Kings Temple festival hosted by the northern midlands province of Phu Tho will be held from April 21-25 (6th to 10th day of the third lunar month) with an array of cultural festivities. The 2018 Hung Kings Temple Festival is set to unfold at the Hung Temple Complex in Viet Tri city and neighbouring communes, in Phu Tho province from April 21 - 25 (from sixth to tenth day of the third lunar month), with the participation of Thai Nguyen, Quang Nam, Binh Duong and Kien Giang provinces. 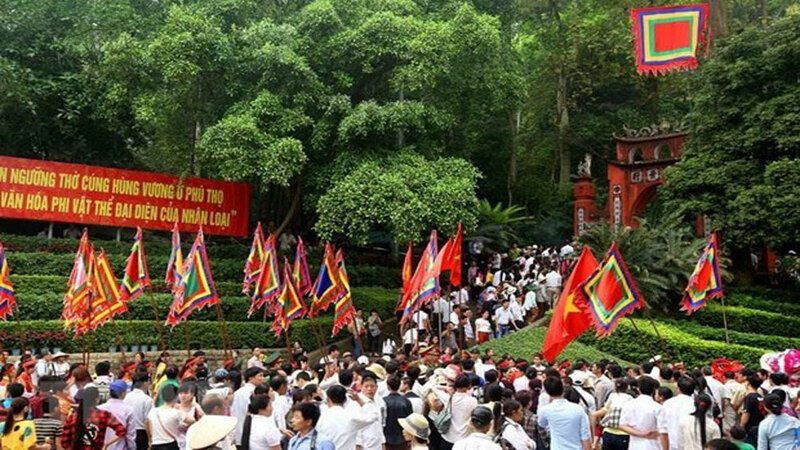 A series of celebratory activities are taking place in northern Phu Tho Province to commemorate the Hung Kings, the legendary founders of Van Lang – the first known State of Vietnam.